1. First, click Turn editing on in the upper right corner of your course’s homepage. 2. 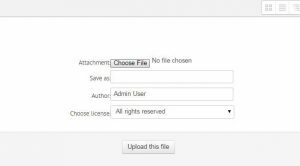 In the week/topic in which you would like a link to your file to appear, click the Add an activity or resource drop-down menu, and select File. 3. Enter the name that you would like to appear for your file. Then click the Add icon button in the content section to display the file picker. 4. 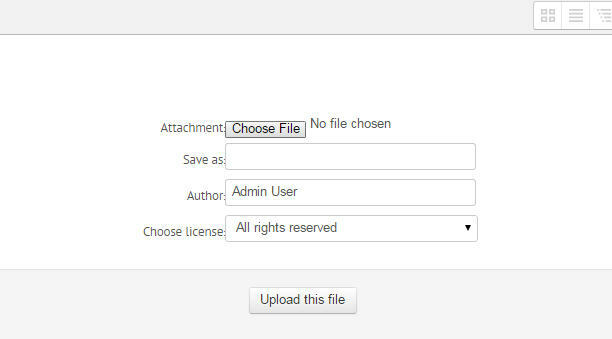 Select the file you would like to upload using the file picker. 5. Clicking the Choose file button will pop-up a window in which you can choose a file from your computer. Choose the file. 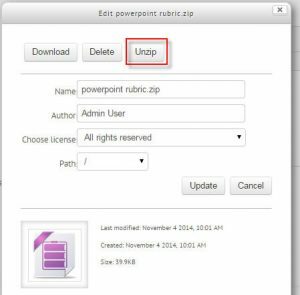 You may (but it’s not required to) rename the file before you click Upload this file. 6. Click the Save and return to course button at bottom of the page. A link to your file will now be on your course homepage. 1. First, turn on editing by clicking the Turn editing on button at the top right of your course homepage. 2. In the desired week/topic, click the Add an activity or resource drop-down menu, and select Folder. 3. Give the folder a name. 4. 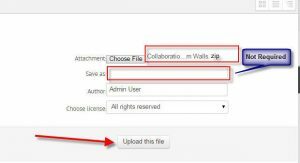 Under Content, click the Add icon to select files you have already uploaded or to upload new files (see Adding or Linking to a File above). 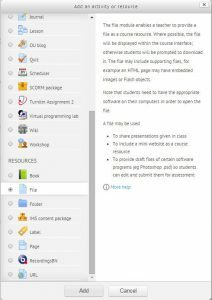 Be careful about what is in the displayed directory as all files and subfolders in the directory will be visible to students. 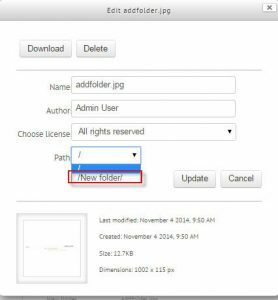 You can click the Create folder icon to organize files within the linked folder by creating nested folders. To move files into the nested folder, choose proper folder Path. 5. When finished, click the Save and return to course to return to your course homepage or the Save and display button to view the files in the directory. 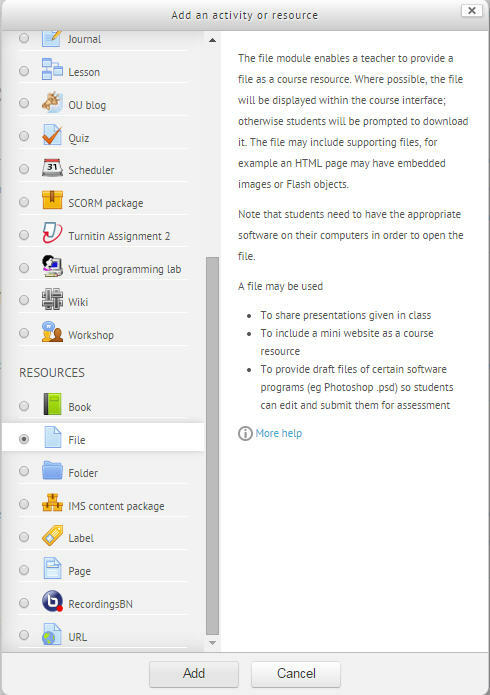 These files and folders will be available in the “Server Files” repository. 1. First, make sure all of the files you would like to upload together are placed into one folder on your computer. 2. On a PC, right click on the folder in which all of your files are located and, under “Send to,” click Compressed (zipped) folder. On a Mac, ctrl+click the folder and click Create archive of [folder name]. 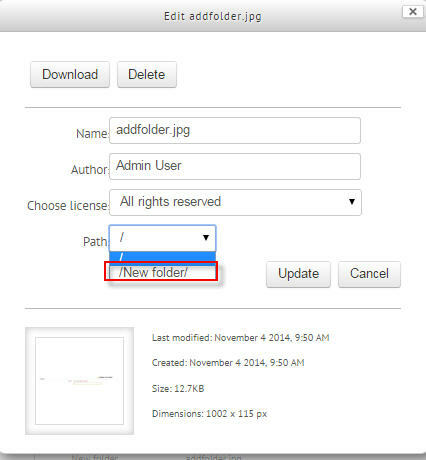 In both cases, a new file will be created with the same name but with a “.zip” extension. 3. On your course homepage, in the section you want the link to the file to appear, select Folder from the “Add an activity or resource” selector. 6. Click Upload a File, click Choose File and locate the zipped file you just created on your computer. You may rename the folder before clicking Upload this file. 7. Click the uploaded folder, and select Unzip. 8. An unzipped version of the folder will appear. All of the files in the folder you uploaded should now appear in that folder. 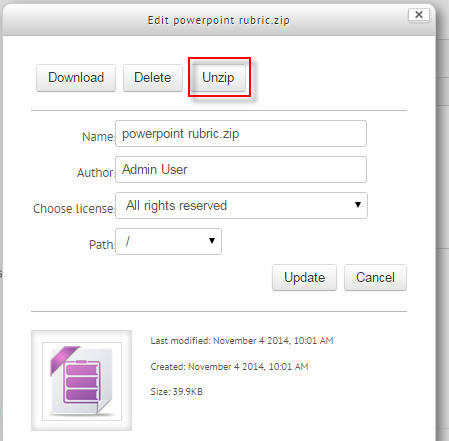 Delete the zipped folder, and click Save and return to course at the bottom of the page.